Have you been scratching your scalps on where to go for a relaxing and refreshing walk in Singapore? 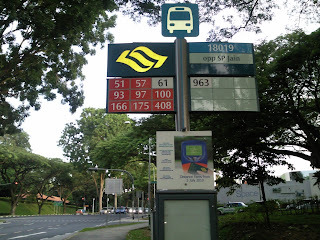 Or are you just 'too busy' to find any interesting places in Singapore to strecth out our rigid muscles? Stop giving excuses now and start moving your butts. Singapore Southern Ridges. The area is free and fresh - see basic info below. taking hundereds of photographs at a rate of 1 pic/1 minute interval. 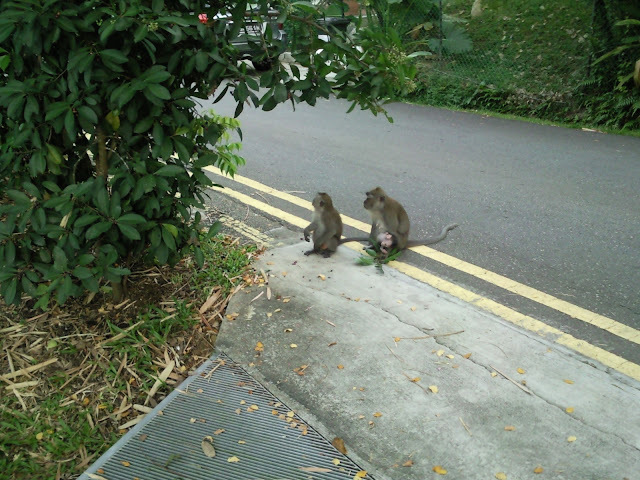 its mum and the monkey daddy sitting on the metal rails staring at you. Rmber not to feed them as they might attack you and worse you may risked being fined by the forest wardens there and the fine is hefty. * Reach there before 8am to enjoy the breezy and morning sun, and you'll complete the journey before 930am. * Clothings to be as light as possible. Although few mosquitoes spotted, wear a long pants if you want to. * Wear a head cap to block off the excessive Uv rays off your delicate eyes. * Must bring along at least 1 bottle of mineral water to quence your thrist - its an oasis saviour in this open air forest. Pictures speak louder than words, I'd like to share with you some of the interesting shots I took in this blog here. The entire photo alblum can be found here (to be updated). "...the journey of a 9,000 metres begins with a 1st little step..."
After the Alexandra Arch: beginning of my journey and exciting forest walk, let's roll.. Vroom! You should be able to spot someof them at the start of the journey nearby some houses.
" mummy, mummy.... let me play with this leaf , i can take my breakfast later "
"why is this maaaad guy taking picturesss of us? 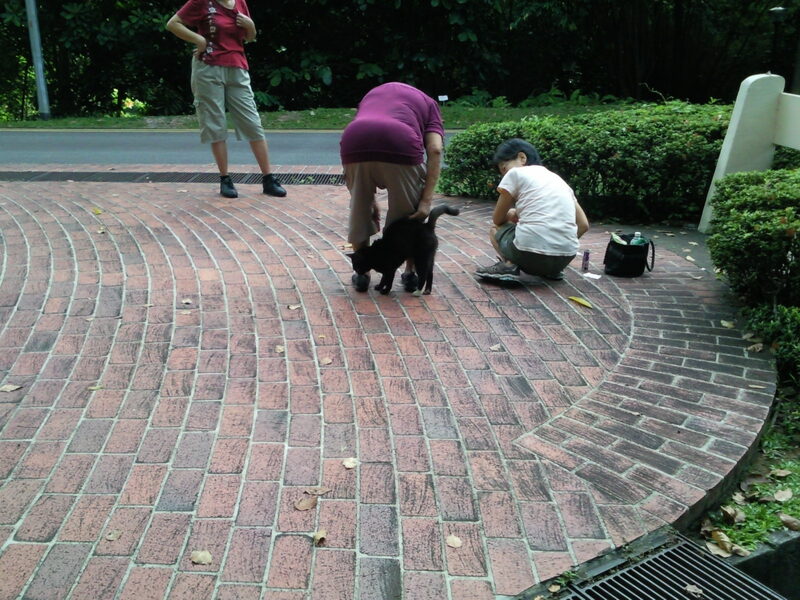 The cat volunteers are only interested in those fat cats and we are really hungry now! Check this cameraman out for any bananas to fill our 1st breakfast of the day. Take out anything from him. Boh Hu, Hei Mah Ho! (No fish, prawn also good)"
Scenic view at the forest walk metal bridges, you can spot walkers/strollers/crawlers and even joggers. Get your lazy bum off the chair and do some real jogging. bridge that look like waves, its real hot here! Still can't get enough of it? Here's my entire photo album HERE for you to enjoy while having your cup of coffee. Have a nice bloggy day! 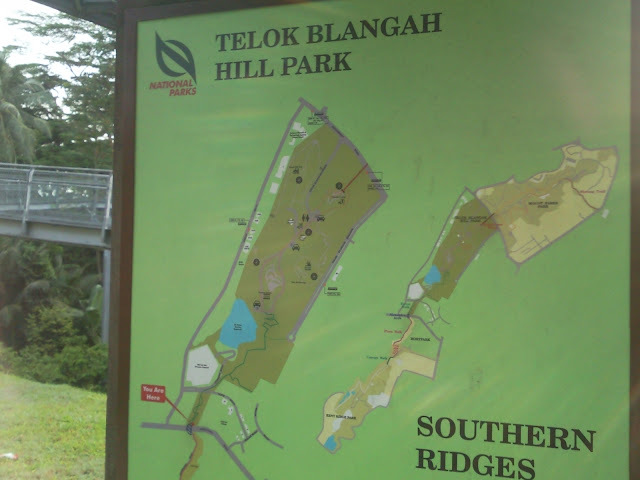 The Southern Ridges (Chinese: 南部山脊) is a 9-kilometre (5.6 mi) trail that connects parks along the southern ridge of Singapore. 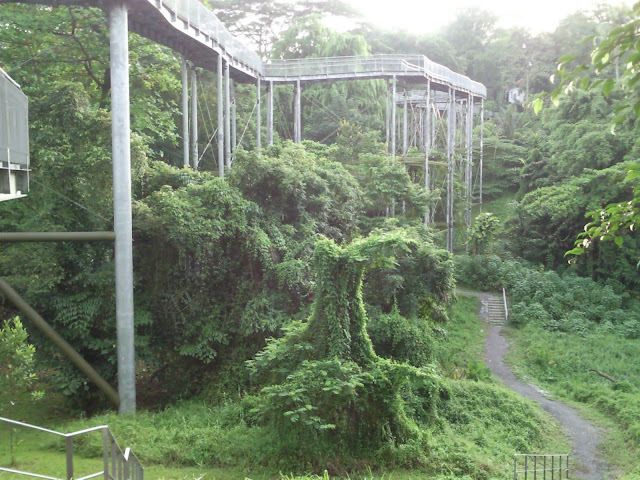 Some of the attractions along this trial include its greenery and the connecting bridges. This project linked up the parks between the West Coast Park and HarbourFront. The idea to link these parks were coined in 2002 by Urban Redevelopment Authority (URA) and it took 2 years to complete and cost S$25.5 million. Mount FaberThere are 3 parks that are connected to each other: Mount Faber, Telok Blangah Hill Park and the Kent Ridge Park. It is a 34-hectare park which is a popular place for wedding couples. A series of semi-circular terraces located at the top of the park is the Terrace Garden - the main feature of this park. Marang Trail (Chinese: 玛朗小径) is 800 metres (2,600 ft) long and an elevation of 70 metres (230 ft). It extends from Marang Road, just behind the HarbourFront MRT Station to the cable car station at the Jewel Box on Mount Faber. The trail consists of steps and shaded footpaths through secondary forest. 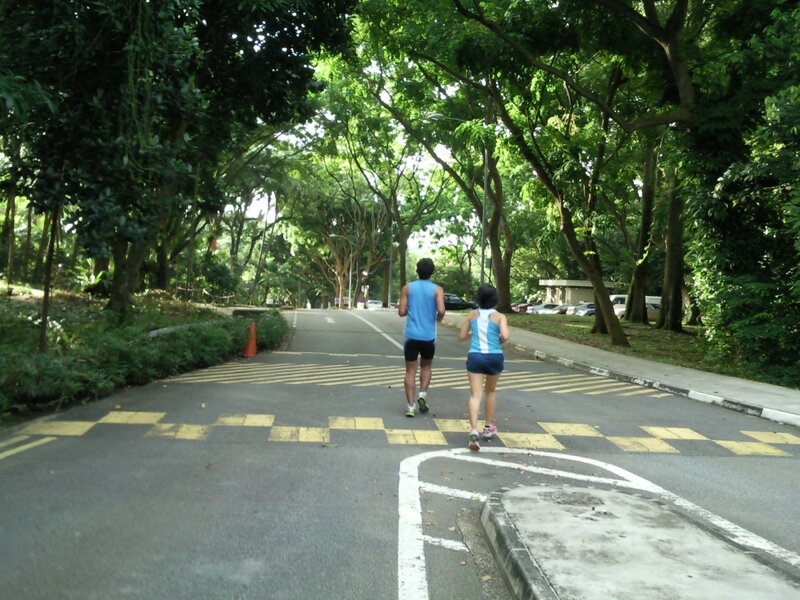 Faber Trail (Chinese: 花柏山公园小径) is a 1-kilometre (0.62 mi) long trail going through the Mount Faber Park. It ends at the Henderson Waves. At its peak, it offers panoramic views of the southern part of Singapore and the Southern Islands. 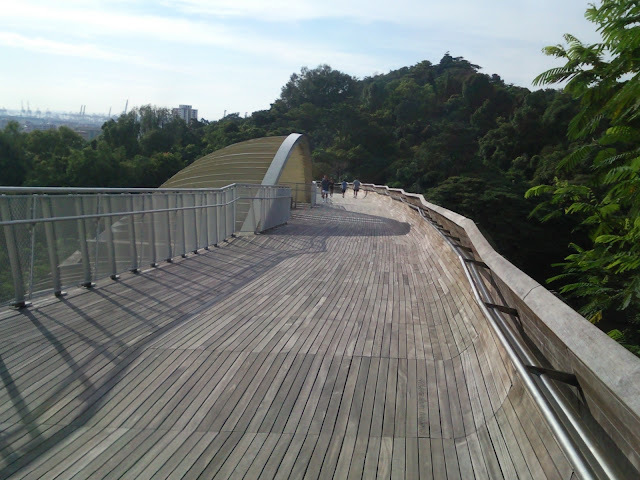 Henderson Waves (Chinese: 亨德森波浪桥) is a 274-metre (899 ft) long pedestrian bridge. 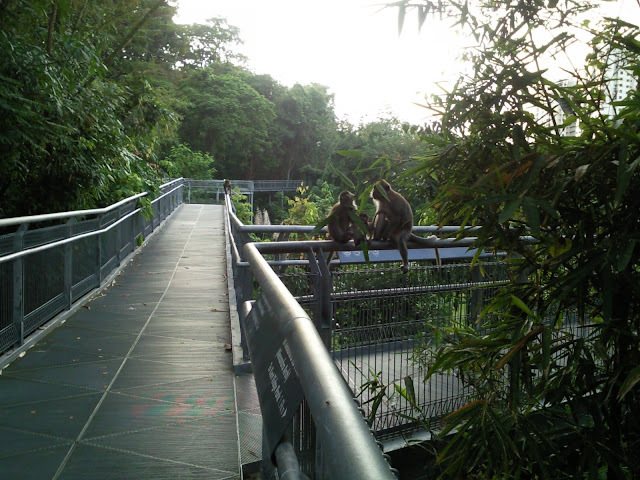 At 36 metres (118 ft) above Henderson Road, it is the highest pedestrian bridge in Singapore. It connects Mount Faber Park and Telok Blangah Hill Park. It was designed by IJP Corporation, London, and RSP Architects Planners and Engineers (PTE) ltd Singapore. Hilltop Walk (Chinese: 山峰小径) is a 1-kilometre (0.62 mi) trail which runs through Telok Blangah Hill Park. The trail connects on one end with the Henderson Waves and the other with the Forest Walk leading to Alexandra Arch. Forest Walk (Chinese: 丛林小径) is a 1.3-kilometre (0.81 mi) long walkway that cuts through about 50 metres (160 ft) through the secondary forest in Telok Blangah Hill Park and connects to Alexandra Arch. 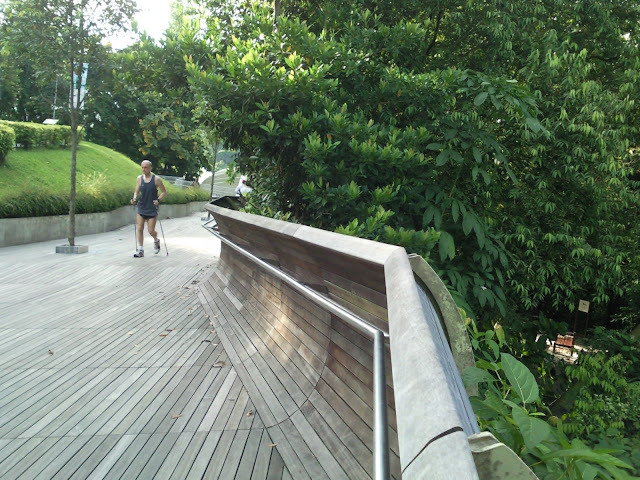 The raised walkway with heights ranging from 3 metres (9.8 ft) to 18 metres (59 ft) brushes the canopy of trees and offers a bird's-eye view of the forest. Alexandra Arch (Chinese: 亚历山大拱桥) is an 80-metre (260 ft) long bridge that features a curved deck and tilted arch like an opened leaf, connecting Alexandra Road and Hyderabad Road. It was designed by Buro Happold with LOOK Architects. The Gillman Village which was a former British military camp in the early 20th century now housed mixture of restaurants, pubs and art galleries. Like the Henderson Waves bridge, Alexandra Arch will be lit with colour-changing LED lamps. At the end of the Alexandra Arch, there is a path lined with flowering plants which leads to the HortPark. Floral Walk is a 300-metre (980 ft) trail which offers a stroll along a path lined with flowering plants. It forms the gateway to HortPark (Chinese: 园艺园林) – the gardening hub. It is a 23-hectare park Southeast Asia’s first one stop shop for gardening-related recreational, educational, research and retail activities in a park setting. Some park highlights include themed gardens as well as outdoor display plots showcasing designs and ideas for home gardening. 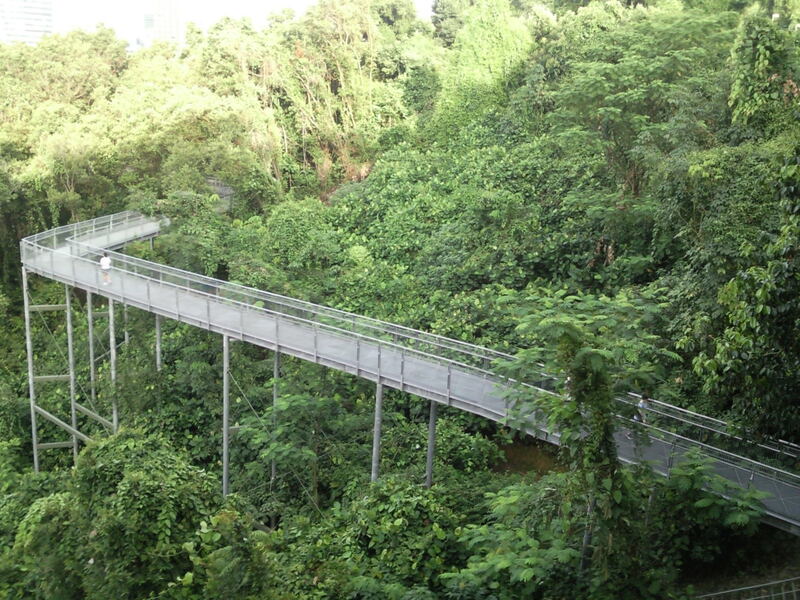 Canopy Walk (Chinese: 天篷走道) is a 300 metres (980 ft) trail which links Kent Ridge Park to Reflections at Bukit Chandu - once known as Opium Hill and site of one of the last battles of Singapore in World War II and HortPark. Elevated 16 metres (52 ft) at the centre, Canopy Walk goes through secondary forest with groves of Tembusu and dominant trees of the adinandra belukar. It is also filled with rich wildlife that lives there, such as squirrels, sunbirds, doves, lizards and white-crested laughing thrushes. ooohh..Such a nice place to spend with family. I have been wanting to make a trip there. This entry now motivates me to go even sooner! yeah RJ, time to pack up your walking shoes and water bottle this weekend for a nice cool walk at Southern ridges of Singapore. Keep up the amazіng work.